EFT 3.2 Now @ DriveThru! Reggie & Babbette decide a rejuvination is a terrible thing to waste and continue their travels on to Venus. Inbound to Terra's sister planet, our revitalized couple meet an old friend with news of a very interesting scientific find. They soon learn some new ways how curiosity can kill the cat. At that time on Ceres Guy's unpleasant cousin Pierre from Terra arrives. It isn't long before Pierre's pompous attitude lands him in lethal trouble. 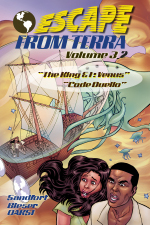 The thrilling adventures of life in the belt continue in volume 3.2 of ESCAPE FROM TERRA!